Graveside services are scheduled for Wednesday at Woodbine Cemetery for Vernon “Benham” Laman of Artesia. Laman, 97, passed away Sunday, Dec. 9, 2018. Ty Houghtaling will officiate the services. A memorial service will be held at a later date at First Baptist Church. Vernon was born June 28, 1921, in Mason County, Texas, the fourth of 11 children born to W.J. and Lou Edith (Brown) Laman. The family moved to New Mexico – the land of milk and honey – in 1933, where they eventually settled in the Cottonwood area. Vernon entered the Air Force on his 21st birthday in 1942, serving for three years, two months, and 27 days. After leaving the service, he married Idella Busby on July 26, 1947, in Roswell. Vernon worked as a mechanic and farmer. 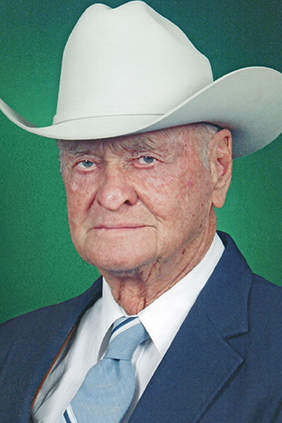 He then owned and operated Laman Trucking for 35 years, transporting alfalfa hay from the Pecos Valley to the Texas Hill Country. An excellent horseman and teamster, he realized the lifelong dream of raising miniature mules and training them to pull a wagon. He built a wagon using a $20 VW carcass fitted with a wagon seat he had ridden on as an infant. With this team and wagon, he collected many trophies from parades in New Mexico and Texas until he was 85. Throughout his life, Vernon was always interested in nature, hunting, music and the Spanish language. He dearly loved introducing his grandchildren to every animal at the zoo. He had lots of friends in the Pecos Valley, Junie Kruger of San Antonio, Texas, and James Wayne Howell of Seven Rivers. Survivors include his wife of 71 years, Idella, of Artesia; son Roger Laman of Artesia; daughters Pamela Stovall and husband Terry of Clovis, Debra Laman of Artesia, and Terri White and husband Marty of Amarillo, Texas; grandchildren Jodi Stovall of Lodi, Calif., Jill Stovall of Clovis, Jennifer Bartlett and husband Cole of Windsor, Colo., Stuart White of Amarillo, and Marcus White and wife Chelsea of Grapevine, Texas; great-granddaughter Savanna Bartlett of Windsor; sisters Hazel Brown of Comanche, Texas, Loma Ranne of Llano, Texas, and Betty Pelts of San Marcos, Texas; and numerous nephews and nieces. He was preceded in death by his parents, W.J. and Lou Edith Laman; brothers Aubrey, Roy, Barney, Grover, Cecil and Dub; and sister Gladys. The family wishes to express their appreciation to the staff of San Pedro Nursing and Rehabilitation Center in Artesia. In lieu of flowers, the family requests memorial contributions be made to The Baptist Children’s Home in Portales or a charity of choice. Arrangements are under the direction of Terpening & Son Mortuary. Condolences may be expressed online at www.artesiafunerals.com.